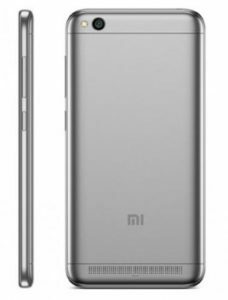 Xiaomi Redmi 5A is on of the popular smartphone that made an entry in the market back 2017, November. The phone comes with Dual-sim mechanism. Xiaomi Redmi 5A comes with awesome features outside the box. The phone is assembled with 5.0 inches display supporting resolution of 720×1280 pixels. The version of software installed on it Android 7.1.2 (Nougat). It is equipped with quad-core 1.4 GHz cortex-A53 Snapdragon 425 processor for higher performance. It provide enough storage capacity for its users, as it include two varients 32 GB with 3 GB RAM or 16 GB with 2 GB RAM and also support micro-SD card upto 256 GB. The camera of the phone is quite awesome offering 13MP primary camera with LED flash including features and 5MP secondary camera. The connectivity medium include WLAN, Bluetooth, GPS, Infrared port, Radio and USB. The sensors on the phone include Accelerometer and proximity. It is powered by 3000 mAh battery for long and stable performance of the phone. The price of Xiaomi Redmi 5A in India starts from 5,999.